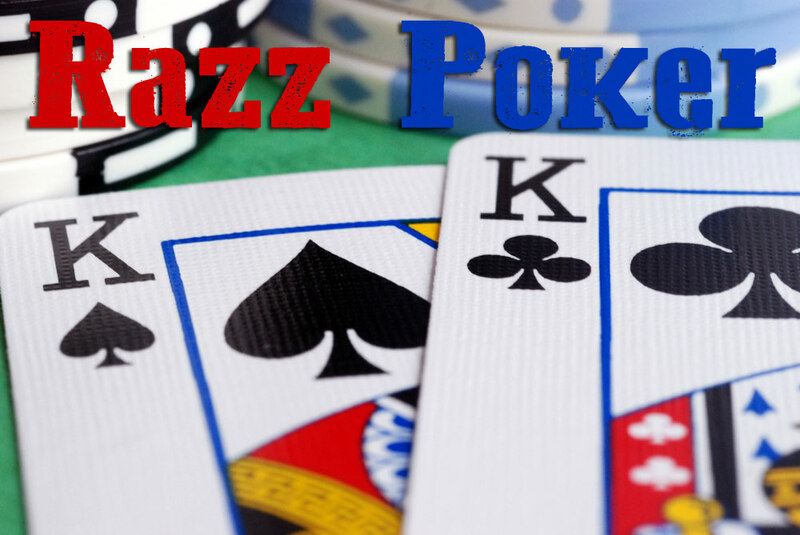 If you play Stud, you’ll get a kick from playing Razz Poker online. Although there are similarities to 7-Card Stud, Razz enjoys its unique niche. This article is for anyone interested in playing Razz, even if you are a novice. It sets out the principles of playing Razz poker online, with some helpful online poker tips to give you a heads up. Keep in mind that if you can already play 7-Card Stud, the following sets out the variations that make Razz distinctive. Find out how to play 7-Card Stud, if it’s completely new to you. Who makes the initial bet is decided by the value of each player’s show card. Players with the highest value show cards must start the action. Show cards are ranked at face value, lowest through to highest. Aces are classed ‘good’ – this means the highest value cards are Kings. If 2 players tie on a high card, show cards’ suits break ties. Suits are alphabetical through best to worst – clubs/diamonds/hearts/spades. Players required to bring choose from 2 options – bet an amount that equals the ante or complete the bet by betting the entirety of the small bet. What distinguishes betting rounds in Razz from Stud is deciding where the actions begin for the hand. In other words, unlike Stud where the highest value show cards bring in a game, with Razz poker it’s the lowest value show card who starts the round. Pairs are classed as high value – so, a player holding King-Queen Clubs will have a superior 2-card hand to a player with 2/diamonds and 2/hearts. A Razz hand is only as low as the value of its highest card – here are a few other examples to consider. Example Hand 1: 3,3,3,5,5 – unlikely to win the pot with this. Example Hand 2: 9,8,7,6,5 – chance to win increases. Example Hand 3: 5,4,3,2,A – you’re rocking! Similar to Stud, Razz deals 7 cards per player. Once the first 3 are dealt, with the betting proceeding, players still in the hand are dealt a further exposed card known as 4th Street. The player with the lowest value exposed hand again acts first – and can opt to check or bet the same amount to the small bet. Another betting round ensues, with another exposed card – 5th Street – as before, a player with lowest exposed cards acts first. From 5th Street, bets and raises are placed incrementally to the table’s maximum big bet. 6th Street applies the same play rules as 5th. For players still in the hand, a face-down card is dealt – 7th Street. Bets/order as 5th and 6th. Following the final betting round the remaining players enter the showdown, wherein the players make the best possible 5-card hand from their 7 cards. The 2 cards are redundant to the hand’s value and not included to review the strength of players’ hands. The player who must reveal their hands first is the last raiser/bettor, but if the final round saw no bets it’s the seat one/closest to seat one player who must show first. The rest reveal clockwise. The pot winner will have the best 5-card low hand, with no qualifying hand needed. Starting hand – anything with 7-low and superior is strong. Starting hands with 3-cards to the wheel are great but you must hit more cards to make the wheel. Stealing blinds and antes are pivotal – if you get lowest show card and action folded to you, then raise. Attack checks – your opponent checks when show cards are low – likely their hidden cards are problematic. Your show cards low? Try and take the pot right there. Make 5th Street your limit – you’ll know the score, as most cards are now exposed. Don’t wait beyond it to fold. Focus on the up cards – the more the cards you need are out, the odds reduce you will hit it. For more articles on poker tips and online gaming, check out upcoming Posts and our Archives to keep right up to date.